This week we are going to talk about drinking! But first, I must share a story about this crazy lamp. This past weekend I went to a flea market in Brunswick, ME, and what a market it was! Tons of people, tons of stuff and it was amazing that my allergies didn't go wacky on me with all the dust everywhere. I didn't have an agenda at all, but when I saw this lamp my jaw dropped open. I ran to it saying under my breath, "oh my god, oh my god! I can't believe this is here!" Back story: Erica and I have an aunt & uncle that own a restaurant/bar near our hometown, Metro's Restaurant. 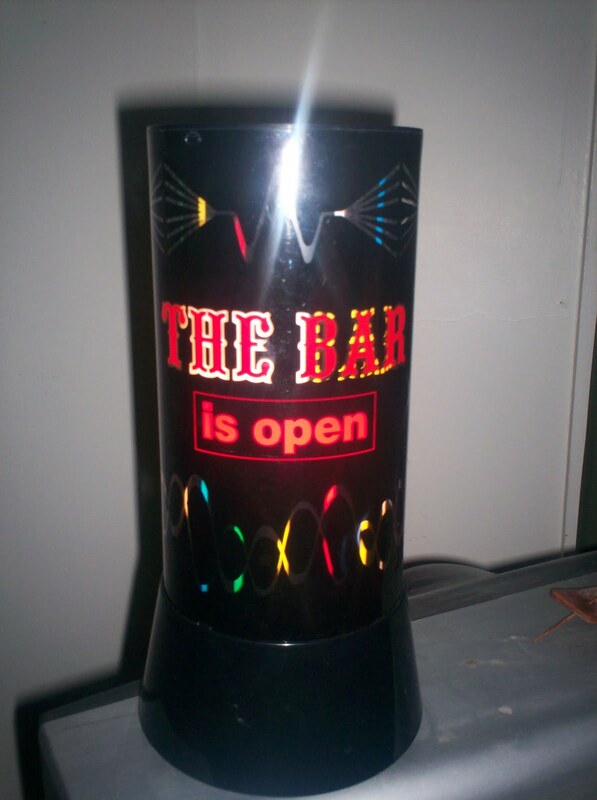 For as long as I can remember, this exact lamp has been sitting on the bar collecting dust. When I was a kid, I would stare at it as if it was hypnotizing me. The inside of the lamp has a slow rotating screen, so the colors seem to be moving clockwise. To stumble upon this at the flea market was just crazy nostalgia. 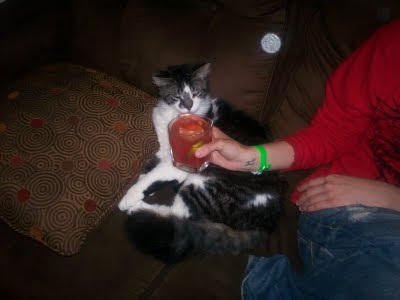 But it also was an amazing way to usher in this time of year when drinking fruity, yummy drinks makes complete sense! Earlier in the week, before this amazing lamp came back into my life, Eric texted me saying that strawberry margaritas were definitely on the menu this weekend! Yet another event we have been planning for summer and warmer days. It worked as far as getting the participants together, but the weather wasn't cooperating. Who cares! We'll stay inside snuggled up on the couch, watching sci-fi movies and drinking as if we were on the beaches of Cancun! I'm not a big drinker and I can be pretty picky about what I drink. Certain alcohols affect me more than others. For example, it doesn't take much vodka, gin or champagne to give me an excruciating migraine. Beer, as tasty as it can be, makes me bloated. Not to say I don't partake in some superb brew at a little place called Novare Res. But alcohols that work better for me are rum, tequila and wine. Mind you, this is just me and everyone is different. The measurements I'm going to list are going to be approximates. Depending on how you like your drinks, you can adjust however you like. 1) We are going to start by making our own "sweet n sour" mix. Start with strawberries in a medium sized bowl. Add sugar to the berries and toss. Your going to add enough sugar to create a heavy dusting on the fruit. Let them set to macerate for about 30 minutes. 2) Put the berries in a medium sized pot and cover with water. Just cover the berries, its easier to add more water than to take it away. Simmer on medium heat for about 15 minutes. If you want a clear strawberry syrup, do not stir or crush the strawberries as they are simmering. It will result in a cloudy syrup. 3) Once the syrup is done, let it set and cool over a ice bath. 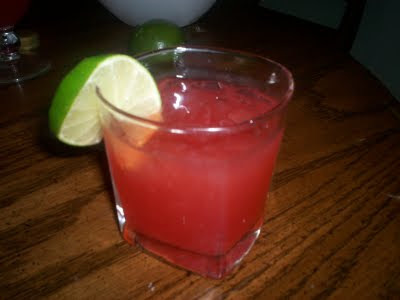 Strain the syrup from the berries and add the lime juice. Taste the syrup to make sure its to your liking. Just remember that it is going to be mixed with other ingredients. So it will be strong, but it will get diluted. lime wedge to garnish or add a squeeze of fresh lime juice for more zing! As you can tell by the title this is just part one. 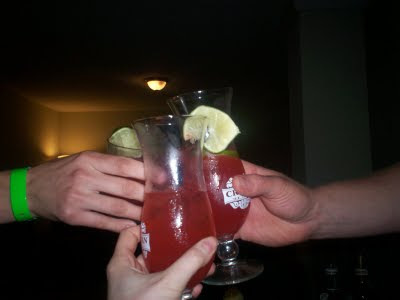 Not only did we have delicious drinks, but our friend made a great dinner! But I will leave you hanging in suspense, so tune in next week for a great story and a great recipe by our friend Amber. Amber's kitty LuLu joined us for drinks and movies.